It has been another exciting two days in Almaty! Friday, I went to the National Academy of Sciences Library where I spent the day taking notes on some Russian-language literature on Soviet nuclear tests in Kazakhstan. The librarians were so nice and the whole experience was pretty neat. Considering I spend 90% of my time in DC on the lower level of Georgetown's library, it is only appropriate I spend some time in the library here. Friday night, I met up with my American friend, Adam, who shares my love for Central Asian people and culture. Adam plays the guitar, dombra, dutar and shashgar rawap -- a master of stringed, long-neck lutes. He now lives in Almaty and teaches music at the conservatory. One of his students DJs at a local banquet hall. Adam invited me to come along, meet his students, and watch Adam perform. What an entertaining evening. 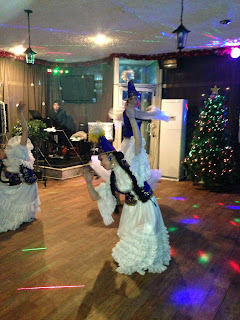 In the video attached, Adam is playing a traditional Uzbek song, while guests at the party dance. It turns out, Adam was performing at the New Years party for a group of coworkers at a medical association. I started chatting with some of them. One woman works for an NGO that works to improve public health in Kazakhstan, while another man was a doctor. They were both so gracious and invited me to visit their office. While I unfortunately do not have time on this trip, perhaps in the future. Either way, I love immersing myself in these cultural events. It is such a great chance to interact with people in their element and gain insights into Kazakhstani and Central Asian culture. And extremely entertaining. This group was particularly fascinated by the fact that Adam and I are both Americans who just happen to be spending time in Kazakhstan and who have some knowledge of Central Asian culture (Adam also speaks Kazakh). Today, I returned to the library and then had coffee with a former government official who was active in the international negotiations for Kazakhstan in the 1990s. A fascinating conversation. Снегорошка и Дед Мороз! This is Santa Claus and snegoroshka (snow princess), Santa Claus' niece A Soviet cultural staple that is still popular today. They made an appearance at the holiday party. Dancers performing in a traditional-style Kazakh costume. Alas, I am out for the evening. Tomorrow morning, I'm going to the bazaar! Not just any bazaar, but my favorite bazaar -- Almaty's green bazaar!